This is 1/2 a recipe. I had 3 steaks to do. We’ve all been there. It’s a holiday and the stores are closed – and we’re out of something critical. With me, I always blame my lack of planning on being rushed, or busy, or frustrated by the hordes the day before. But I know it’s just me. Sometimes a person just forgets. 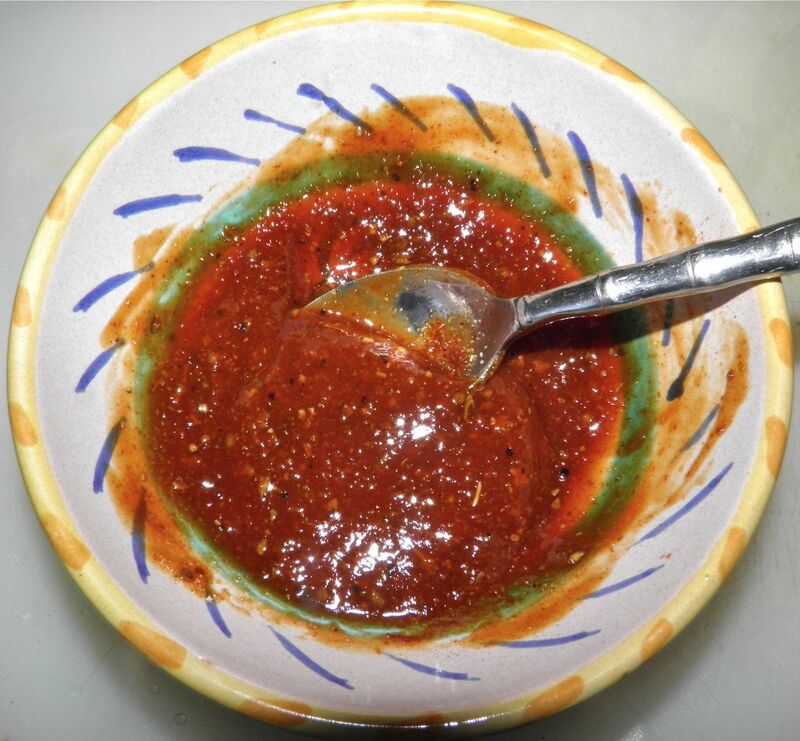 Well, if you find yourself in the situation where you either don’t have – or run out of – barbecue sauce, take comfort in the fact that you can easily whip up a more than passable substitute from a few kitchen staples. It all starts with ketchup. We all have that and hardly ever seem to run out. All you do from there is add some "oomph" to it. If it’s a holiday, one thing you’re almost certain to find hanging around is booze. That is key as well. It can be whisky (I had some left over from making sausages), rum, beer or even sherry. It takes some of the ketchup-y taste out and begins the transformation. Just a few more simple ingredients and you’re on your way. It does benefit from sitting for a short while, because the spices "bloom." But if you’re pressed for time you can use it right away. Another useful ingredient is liquid smoke. I’ve written about liquid smoke a few of times on this blog. It’s a great way to get smoky flavour quickly into sauces. The final ingredient(s) is spice and herbs. Good barbecue sauce always has a bit of fire and herby taste. All these things (or most of them) can be found in your cupboard. In fact, this tastes better than a lot of purchased barbecue sauces. It actually has some taste... and the benefit of as much "taste" as you want to add. At pennies to make, perhaps forgetting to put barbecue sauce on your shopping list isn’t such a bad idea. Mix together in a small bowl. Taste and adjust spices as you wish. Let sit for 30 minutes. Then use as you would ordinarily. Great for pork, chicken or fish.